Meet Teresa, one of our travel experts for French Polynesia. Paradise and world-acclaimed service come together at the St. Regis Bora Bora Resort. Located on the Motu Ome'e, just a few minutes from Bora Bora airport, reaching out across 44 acres of lush landscaping edged by powdery white sands and a crystalline lagoon, the resort represents the epitome of carefree elegance. Video copyright St. Regis Bora Bora. Offering the most luxurious accommodations in the region, its 91 exquisitely designed accommodations feature the largest over-water villas in the South Pacific as well as stunning beach villas, showcases for the warm glow of exotic woods, hand-woven fabrics and regional art. 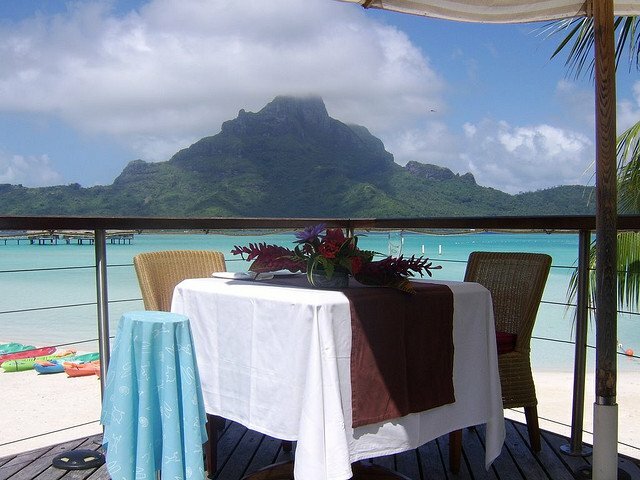 Set amidst lush unspoiled surroundings and pristine waters, guests enjoy spectacular views of the main island of Bora Bora as well as the mystical Mount Otemanu. The towering majesty of Mount Otemanu is an ever-present symbol of the lofty luxury and impressively personalized service that are the hallmarks of St. Regis.